Rhythmic gymnastics is a sport where all famous sportswomen are pretty young. The gymnasts get access to the most important competitions like the Olympic Games since January 1st of their 16th year. The most well-known gymnasts like Yana Kudryavtseva, Delpphine Ledoux, Sylvia Miteva, Evgenia Kanaeva, Jasmine Kerber, Laura Zeng reached the great results in rhythmic gymnastics at the early age. It is quite usual for such kind of sport as rhythmic gymnastics to attract girls to start training as soon as it is possible. The reason is simple. If you start early, it means you’ll have more time to train and to master your skills in this kind of sport. 1. It makes you strong and healthy. The first training period is devoted to the development of flexibility, coordination, balance and strength with the help of basic exercises. Though the elements in the beginning are the simplest, they still influence greatly on correct posture, good muscles development and motor functions improvement. As a result, constant trainings make girls strong, flexible and healthy. It has already been scientifically accepted that such trainings make young gymnasts resist any diseases and improve immunity. 2. It introduces gymnasts to healthy life style. Deciding to take your daughter to rhythmic gymnastics, you may be sure to develop her consciousness to lead a healthy life style in the future. It is not obligatory to stay in rhythmic gymnastics forever, but it is a correct and proper start to any other athletic sphere. The earlier your child will start training, the sooner she will understand how important it is to be physically healthy. Rhythmic gymnastics is not only a source of keeping fit by a set of necessary exercises. It also teaches girls to eat properly because all sportswomen eat a well-balanced and specially worked out diet. Rhythmic gymnastics is a very graceful kind of sport. All elements and movements are very gentle, smooth and elegant. Thus, every girl engaged in rhythmic gymnastics is distinguished from the others with her attractive movements. Girls can notice this difference themselves. Thus, they acquire confidence. There is no doubt that rhythmic gymnasts do not suffer from teenage awkwardness, they possess self-esteem and they move gracefully. 4. It makes you psychologically stronger. Practicing rhythmic gymnastics girls need to spend a lot of time in sport hall to achieve the perfection. The audience loves to watch rhythmic gymnastics performances as they are so gentle. They attract viewers with the feminine charm. But only gymnasts know how hard it is to make this spectacular show real. Spending long hours in the sport hall, gymnasts master and rehearse each element very thoroughly. They need to repeat the same actions over and over again to be sure that it is done without any tiny mistakes. Only those gymnasts who have a strong will power may manage it. Thus, you may be sure that with the help of rhythmic gymnastics your child will learn how to behave in a determined manner. They will learn that working hard you may achieve a lot. 5. It makes you socially active. Plunging in the world of gymnastics you need to interact with different people all the time. The training process doesn’t include only you and your coach. Attending trainings you need to communicate with your peers, gymnasts of different ages. Moreover, you are always kept under somebody’s observation. You are watched by other gymnasts and coaches at trainings and you are definitely watched by great amount of people at performances. As a result, even the shiest girls gain their freedom and become socially active. 6. It develops habits for interaction in a safe environment. Being constantly busy with trainings and with communication with other sportsmen and sportswomen your child will simply have no time for bad companies and habits. The gymnast’s day is very well-scheduled including frequent trainings. It is important to set all necessary for your child priorities at the early age. Choosing rhythmic gymnastics there is no doubt that your child will be surrounded only by the people from the safe, healthy and encouraging environment. 7. It teaches you good manners. Watching the rhythmic gymnastics shows we admire lightness and smoothness of all gymnasts’ movements. This is the result of great coach work because training process does not include only the set of elements with different apparatuses. The coaches also teach their girls good manners. With the help of rhythmic gymnastics girls acquire good posture. Rehearsing all elements over and over again gymnasts transfer this elegant and graceful behavior to real life. They acquire skills for proper and correct social behavior. 8. It helps you to express yourself. Rhythmic gymnastics is a unique kind of sport including traits of many other spheres such as dancing, acrobatics and drama. Each performance is not just a set of perfectly worked out elements. Rhythmic gymnastics performance is a real show where a girl can tell her story by means of movements, music and emotions. Performing in front of a great audience, girls express their feelings in a very individualized manner. 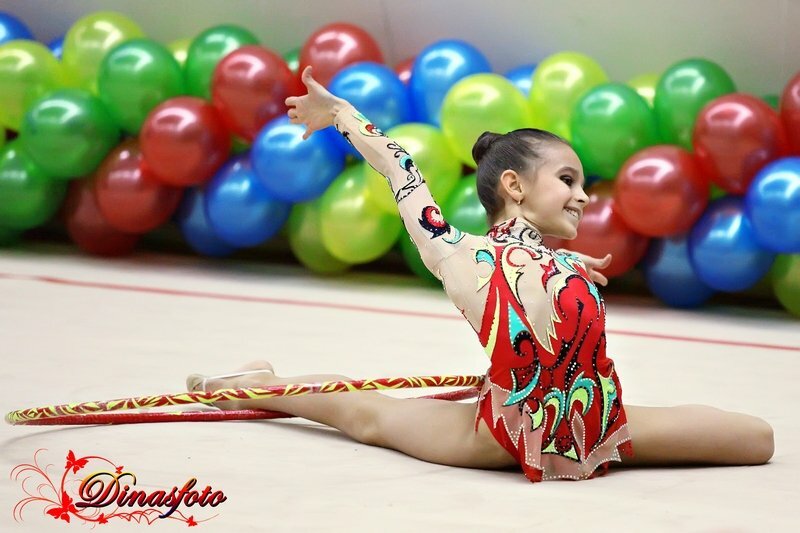 Thus, rhythmic gymnastics helps girls to show what is hidden inside. 9. It makes you successful in life. Girls that from early age are used to train hard acquire such necessary and significant character traits as independence, determination, will power. Doing their best to prove that they are the best on the carpet, gymnasts become the best in real life. They know what they want and they do everything to make it come true. Rhythmic gymnastics teaches not to give up. As a result, girls can cope with any life troubles and become very successful. Find your own suit among our ice skating outfits.